When reading through Christina's Senior Questionnaire, I couldn't help but imagine all of the adventures that she intends to go on as she moves from high school and into college. One of her goals is to go to the top of Mt. Everest, just so she can say she did so, and in meeting her in person, I believe that will happen one day. Even in her stature, she is a strong, determined woman, yet is still kind and generous. 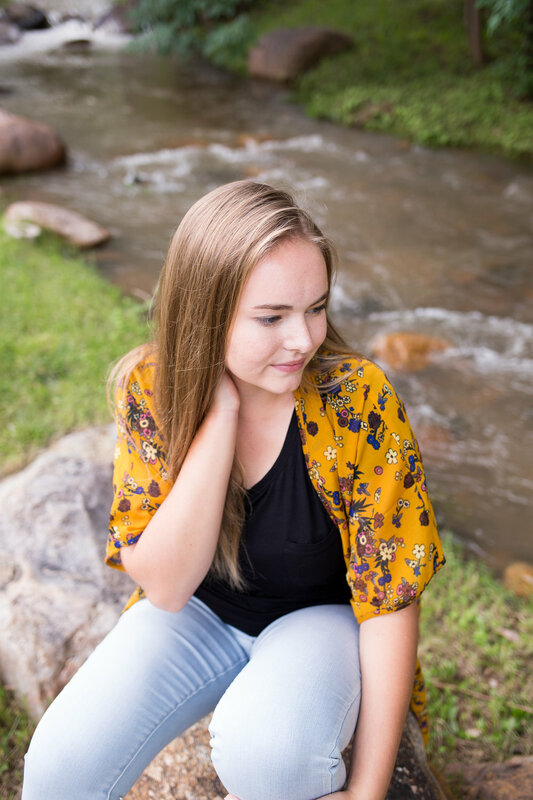 Since I do not have a studio, I hold all of my senior session 'on location', meaning that they are all at an outdoor location that we either choose together, or sometimes the students have a particular place in mind. For Christina, she already had her location picked out, and I was so fortunate to have been able to share in this place with her. Among the Colorado Springs city, there is a hidden gem of a place where there are small streams, tiny lakes, and all of the beautiful flower beds one can imagine. As I walked through the gates, I thought about how every place on this location would be ideal for photos. It was so dreamy. Christina and I were able to pair her outfits with different foliage and combine colors so vibrant, that they matched Christina's spirit. Christina plans to go to college after graduating from high school and eventually off to Medical school. She mentioned to me that she originally wanted to be a vet, but instead changed her mind to wanting to help people instead. Either one, from what I can tell, will be a great option for her, as she is kind, considerate, and hard-working. She is a member of the cross-country, diving, and track teams, and I think from being a part of sports and working with others always helps to prepare you for going into a helping profession. If Christina could give advice to other new high school freshmen students, she would tell them not to stress too much. Quite frankly, that is good advice for life in general, no matter what the age. I appreciated talking to Christina during her session and learning more about her plans and things she is looking forward to. To talk with someone who has the wisdom and the calm demeanor that she did was refreshing. It was a pleasure to be asked to take Christina's senior photos, and I think that the end result reflects her colorful, cheerful, and adventurous personality.